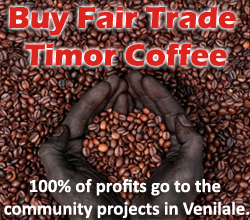 The nearest major town to Venilale is Baucau, the second-biggest city in Timor-Leste. 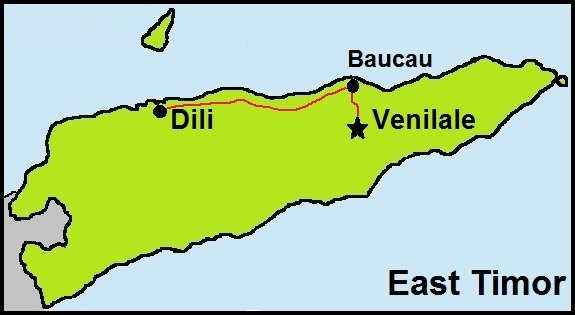 The drive from the capital, Dili, to Baucau (125 kilometres) takes about three hours along a spectacular coast road, and from Baucau it is a further 28 kilometres (about an hour’s drive) south to Venilale. Buses run regularly from Baucau to Venilale and continue 63 kilometres south to the large regional town of Viqueque. How do I get to Venilale from Dili? Hire yourself a 4WD from Rentlo or E-Silva and make your way along the north coast heading east of Dili. At Baucau, turn inland (south) and follow the road to Venilale. 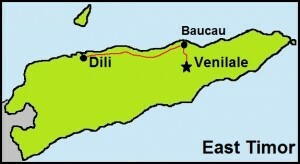 Although only about 150km the trip will take you roughly 4-5 hours from Dili to Venilale. Commit yourself to the adventure of a local bus trip. Jump on a Baucau bus from Dili and get off at a large-round-about-bus-station in Baucau and change onto a mikrolet ‘E’ to Venilale. More difficult than driving but will only cost about USD5.00. Once you are in Venilale, come and visit us at the Venilale Tourist Centre! How to I get to East Timor?